As I alluded to yesterday, the combination of marriage, graduate coursework, a part-time job and church involvement has severely limited my blogging time! Ultimately, though, I wouldn’t have it any other way; I do find snippets of free time every once in a while, which I choose to spend sleeping. It is only by the grace and mercy of a Fall Break that I am able to devote some time to the blog and other things that refresh my soul. In New Testament Greek I, we just had our toughest week to date. In the matter of just one week, we were introduced to demonstrative pronouns, adverbs, and personal pronouns with special adjectival use (a phenomenon difficult to grasp given that it’s not used in English). Quizzes are given weekly on Thursdays, and I’m waiting with bated breath for the score I’ll receive when we grade them Monday morning. I believe I did well, but who knows until I receive the score. I’m also exceptionally lucky to be learning from the professor, whom my wife had and adored in her undergraduate studies at Anderson University. He should write a book about the life of Christ and peace… it would be a bestseller. Anyway, as a class we have advanced remarkably well in the language for just seven weeks; in addition to learning the hymn “Holy, Holy, Holy” in Greek, we can compose sentences like: νῦν βαπτίζομεν ἐκείνους τοὺς μαθητὰς τοῦ κυρίου ἡμῶν καὶ πέμπομεν τοὺς αὑτοὺς μαθητὰς εἰς τόν κόσμον. (Now we are baptizing those disciples of our Lord and are sending the same disciples into the world.) I sincerely hope I’m able to come out of the semesters of Greek with the ability to freely read the New Testament in its original language! Next week we will find ourselves involved with verb tenses other than the present tense, and I have heard from others who took the course that this last week may be the toughest of the whole semester. Let’s hope so! In Old Testament I, our reading through this coming week has completed most of the first seven books of the Bible. We skipped the latter half of Exodus, all of Leviticus, and some of the beginning of Numbers; it’s a “survey” class and we can’t cover every little thing, I suppose. Each week, we have Bible readings, maps to mark according to ancient events found therein, and a commentary on the Bible readings. All in all, it gives an excellent perspective on the whole historocity of ancient Israel, and I feel blessed to be a student of the professor in his final year of academia before retiring. If you are interested in reading these in the future, they are all tagged with the category called OT Weeklies. Furthermore, I’ve set up a category called SOT Coursework for posts related to my academic pursuits in all classes. The next “big thing” that will come due for me is an 11-12 page exegesis for Old Testament class, for which I have chosen excerpts from Genesis 39 (the account of Joseph in the house of Potiphar, and especially his involvement with Potiphar’s scandalous wife). I have selected books and commentaries on the topic (see the picture below! ), but soon will need to get to work on the actual writing part. I’m sure that later in the month, after the exegesis has been turned in, I will feature a teaser from my findings! In Church History, we have breezed our way through about eight or nine centuries of Christendom, and have just recently finished a section on monasticism and the “challenge of Islam.” In the week to come, we will be broaching the Middle Ages head-on, including the inquisition and such. I am doing well in this class as well, though I consider it less important than the others. But one great thing I’m finding about the School of Theology at Anderson University is that I’m relatively free to carve out my own niche, to explore what I want to explore within the context of each class. The term paper for Church History is relatively broad and open; thus I chose the topic of early Jewish-Christian sects of believers, such as the Ebionites, Marcionites, Nazoreans and some of the Gnostics. I am particularly interested in their possible superior application of the message of Jesus than proto-Orthodox groups, especially against the backdrop of the writings of Paul and the Roman Empire’s “institutionalization” of its preferred form of Christianity. 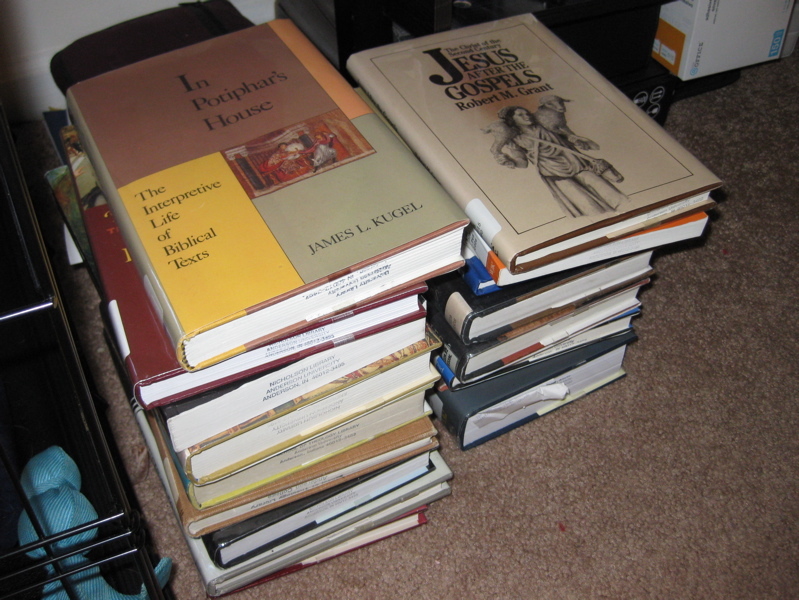 This paper isn’t due until after the Old Testament exegesis, so for the time being, it has taken a backseat… though in the pictures posted above, the right-hand stack of books are research I’ve completed for the paper. Theological Ethics is the class that I was most worried about going into the semester, given that it is a third-year M.Div course and I’m the only first-year in the class. I realize that I could participate more in the class rather than deferring to others, but I scored very high on the mid-term and have gotten good marks for other assignments. It turns out that my fears haven’t been realized! Hallelujah! The discussions and debates we’ve had in class have also been very fulfilling; it has been an honor to learn from the professor and my fellow classmates. There is no major paper in this class, though later in the semester I will have two smaller papers based on some of the ethical case studies we’re assigned. Apart from the classes, I have also thoroughly enjoyed the camaraderie I’ve felt among fellow students and faculty. While it is difficult at times being a commuting student, even I have experienced the wholesome nature of my education, which in itself has been cognitively stimulating. If Lauren and I are able to move to Anderson next year – which hangs on many, many factors – we are chomping at the bit to do so. But if this doesn’t come to fruition, I still feel that the SOT is a true community, and I consider many fellow seminarians true friends. 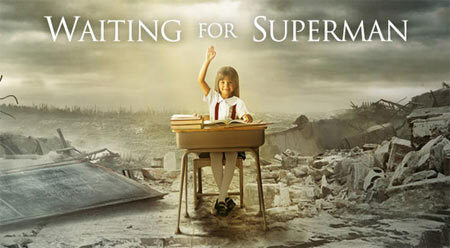 Last night, given her Teach For America connections, Lauren received free tickets to see Waiting for “Superman,” a new documentary about the terrible public education system in our country. It was an eye-opening film, even for this former substitute teacher. But it reminded me that I admire so much Lauren’s passion for early education; she regularly comes home troubled about some aspect of her students’ behavior or performance in class. So many things hold the educational process back, but I affirm the amount of hard work she puts into her underprivileged students. Right now, as I type this, she has been lesson planning for almost five hours with her teaching team, which is a microcosm of the incredible dedication she has for her students. Soon, she may author a guest blog post here about projects she wishes to complete this year from Donors Choose, a website that allows her to seek donors to contribute to specific classroom initiatives. Well, it seems that my rambling has gone on long enough, and besides, coursework beckons! I do hope it’s not another month before I am able to post again!